I’m rather sad at the state of affairs on this section. Hardly a single mention of nano.RIPE! I’m here to correct this wrong, to shine light in this myriad of darkness and to open your ear holes to the strangely unique and catchy artist nano.RIPE. nano.RIPE, synonymous with high pitch squeaky singing. Also feature heavily in a lot of P.A works anime. This is an artist who is accomplished in this market and has mastered their craft for making superb songs. 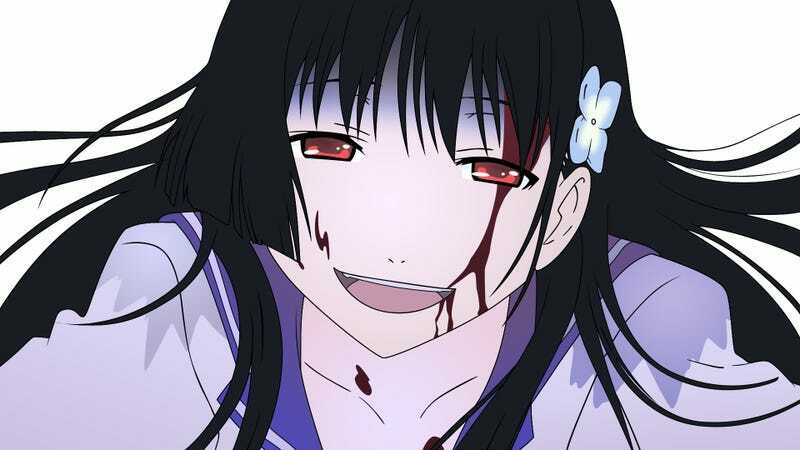 By the by, Sankarea is fun. So the artist is like mustard, you either love it or you hate it. For the analyst, personally I find openings a lot harder to read into, since the main purpose for most of them is to introduce what all the characters look like and a vague idea of their personality through visual effects, throw in a nice little sequence of motion together in the end to flourish the last few seconds and boom that’s an opening. Nevertheless here is what I’ve established which is most probably false and a bunch of lies. Okay straight away, we see our titular character Rea Sanka smiling and sinking into the ground while biting onto a leaf of Hydrangea macrophylla . If this wasn’t a given by the synopsis of the show then I don’t know what to tell you. She’s clearly accepted her fate, throwing away her humanity to become a zombie! Title of the show appears with said flowers blossoming underneath it, and then it seems to be beating like a human heart. I wonder if that’s to portray the idea that even if Rea is dead, she is still human, maybe more human than some as we might see later on. Now the next scene of important though rather easy is the path crossing between Chihiro (the main guy) and Ranko (cousin of the main girl). Notice how they seem to be running on different planes as well, as if a different plane of existence, different purpose and of course different direction. There is the cool effect of seeing Ranko disappear as they both intersect, only to reappear further down the screen. Look at where the characters originated from, Chihiro started from the grey space to run into white, while Rank is the opposite. One way to interpret this is that these characters are never on the same page, can never see eye to eye and maybe, won’t end up together. I mean just look at the fact that Ranko stops running to look back at Chihiro while he continues his run! Now we see Rea family situation, this was rather interesting. Remember how Chihiro and Babu traverse the screen left to right. Here we have Aria (Rea’s step mum) moving left to right, the polar opposite. She’s bend downs to look left like Ranko! The father aims his vision the same direction as he creepily smiles at his daughter. They all look right as if there’s something to be found. Now I just like this scene as we go through some of the minor characters showing signs of frustration. I have a weakness for characters that goes against the status quo, as evident by the girl as she claps her hand in contrast to her friend besides her. It’s funny is all which I thought was worth mentioning. Don’t we all love it when the lyrics just match the scene of frame, as the tennis ball breaks the darkness, or finds light. The translation for the songs at that point was “then the sun, split in half with you, would bring me warmth” Then we see this illuminated sphere break in two! How lovely. Now a lot of weird happens at this stage, I couldn’t really digest this but I’ll make it up so I seem more credible at the end of this. Chihiro is riding a giant dead Babu. Rea reappears from the ground but notice how she appears with her arms out first, as if someone was drowning you leave an outstretched arm hoping someone can save you? Can the dead only bring Chihiro and Rea together? Or the idea of death itself surrounds this show? I don’t know. They hold hands and fly (you know as you do) and fly right into an open grave with R.I.P. Can the cold embrace of death only bring them together? Their love surpass the boundaries of mortality even through death? So many questions for a show I’ve already seen. Fruity File #34: Suspect was caught attempting to trespass into the border late at night. Officers were on the scene and apprehended the suspect in mid climb of the border fence. Suspect was found wearing ripped high school clothes, a duffel bag filled with monopoly money and a pair of scissors. We’ve brought the suspect in the precinct for questioning for tomorrow morning.